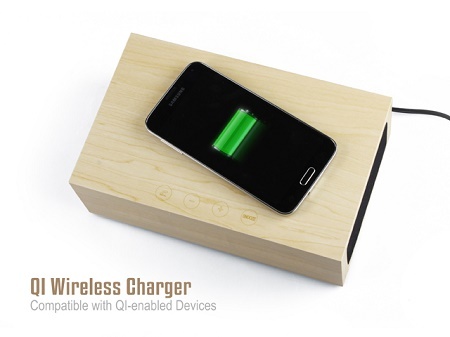 While we don’t have wireless options everywhere we go, you can at least have the option in your home or office through the W2QI Wireless Charging Wood. This looks like a simple block of wood, but can charge your phone, play music, tell you the time, temperature, and even let you answer a call as there is a built-in microphone. In essence, this is a wireless docking station, but has been streamlined so there aren’t any buttons sticking out or cables you would need to worry about. It is Bluetooth enabled so that you can play music without plugging anything in, but you do have the option to use the included 3.5mm audio cable. Volume controls, snooze, and answer call touch buttons are all located on the top. This will work with most smartphones, including iDevices and Android phones. The front panel is LED back-lit to display the time and temperature, While this doesn’t really go over-the-top for a $98 docking station, it would be nice to not have to mess with cables.